Having posted 37 home sales in the Tallahassee MLS in 2012, Golden Eagle Plantation enjoyed its best year since 2007. As one of the most active neighborhoods in the Tallahassee real estate market, we like to review this popular Tallahassee golf course community on a regular basis. Currently, there are 42 homes for sale in Golden Eagle Plantation, and we are seeing some of the best asking prices in over 10 years. 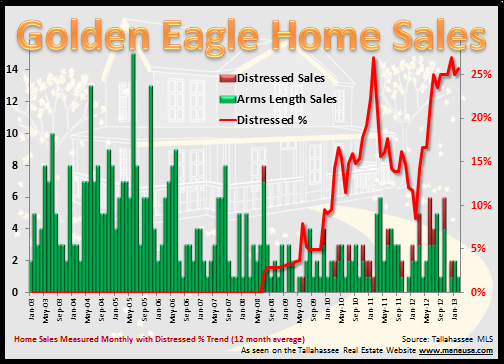 The number of distressed home sales had been declining rapidly going in to 2012, but by the end of the year, 1 in every 4 homes sold in Golden Eagle Plantation were sold under a situation of distress (short sale, foreclosure, bank owned home sale, etc.). Based upon recent lis pendens filings, we do not expect to see a decline in distressed home sales this year. 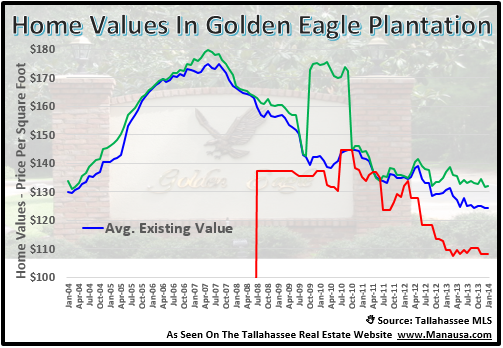 When we remove distressed home sales from the mix, we can see that arms length home values in Golden Eagle Plantation are trending higher. Keep in mind, the sales volume is low enough that specific study is required to determine the sale-ability and value of a home. The real estate graph above shows that the average value of a home sold in Golden Eagle Plantation over the past year has been at about $140 per square foot. Of course, with the past six months averaging only 1 arms length sale each month, this could mean a serious wait time for home sellers not selling under distressed conditions. If you want to know more about how to buy a home or sell a home in Golden Eagle Plantation, just drop us a note and we can help you prepare to make the best deal possible.